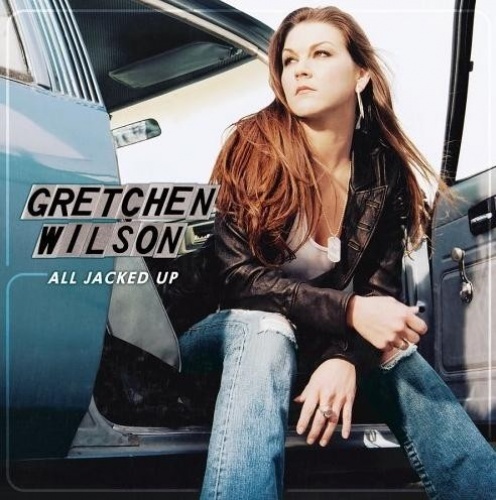 Gretchen Wilson uses the title of her second album as a euphemism for wasted. "Next thing you know, the bartender's pourin'/Shots a flowin', got me stoned and...." -- the moral of the story is, don't pick fights or start trucks when you're "All Jacked Up." But the phrase is broadly applicable, too. "All jacked up" describes a malfunctioning engine as effectively as the roughshod look of an ill-advised one-night stand. Of course it's also a rallying cry for the blue-collar zeitgeist, like Larry the Cable Guy's "Git-R-Done" or the title of Wilson's breakthrough single, "Redneck Woman," and it's that constituency All Jacked Up sings to proudly. It's not its music that makes an impression -- this record was rushed after the phenomenal success of her debut, Here for the Party, with writing and recording squeezed in between continued promotion and performance, and while Wilson's always refreshingly brash as a vocalist, the arrangements are only satisfactory. No, All Jacked Up's lyrics, attitude, and message are its most important parts. In "California Girls" Wilson thumbs her nose at Hollywood excess and body image. "Ain't you glad there's still a few of us left?" she asks, "[Who] ain't afraid to eat fried chicken and dance to Merle?" Haggard himself guests on "Politically Uncorrect," a tribute to the soldiers, single mothers, third-shifters, and believers -- any group you can think of that's been marginalized and/or politicized in the culture war. And in the terrifically unapologetic honky tonk "Skoal Ring," Wilson "don't want a bunch of bling-bling," because the "berry blend on his lips still turns me on." All Jacked Up just keeps building on the themes of Here for the Party, swaggering boldly and nodding to the legacy of George Jones along the way. Wilson is pushing back against the weird plastic and flashbulb "norms" of American popular media with mud on her hands and simple pleasures on her mind. In "One Bud Wiser" she finds solace from a bad breakup in a cold sip of beer, while "Not Bad for a Bartender" is the sequel to Here for the Party's "Pocahontas Proud," with Wilson reflecting on her rise to fame with an air of thanks, amazement, and "it could happen to you" homespun encouragement. We're all in this together, she's trying to say; so let's get some drinks and celebrate the New Redneck.